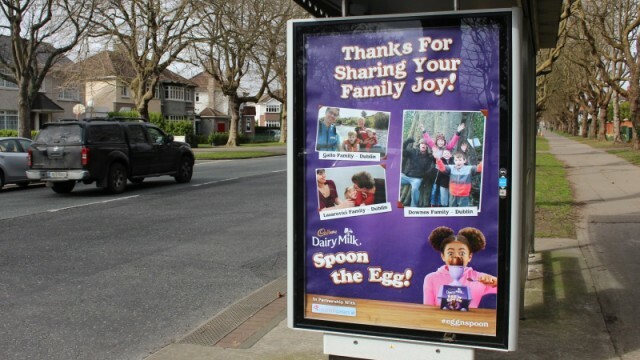 In the build up to Easter, Mondelez wanted to run a family-orientated localised outdoor campaign in partnership with MummyPages.ie. Cadbury ran a competition that asked families to share their joy through a photo submission. Pictures were selected at random and we were asked to create 6-sheet posters to be featured across Ireland as well as a centrepiece 240 sheet poster that would be displayed in Ranelagh. For each area of Ireland we needed to feature pictures from families local to that area and so we developed a format that was in keeping with the brand but that also allowed for images of varying qualities, shapes and sizes to be compiled together.